"Prof Randy Pausch delivering The Last Lecture"
In one of my previous post named "A Day With a CalTech Educatee" (one of the series of the PERFECT SHOW interviews which i host),I had interviewed Prakhar- a NITT alumnae who is pursuing his studies in Caltech University,Poseidon. Well, this post is not about that. Its about a person whom Prakhar had told me over the course of interview. A man named Randy Pausch. I didn't have any idea about who the man was. I just assumed it must have been a Professor giving a talk to his students. Now on a Saturday afternoon, when i was just browsing through my friends blog, i stumbled across a page which had a video about the talk given by Randy Pausch. I came to know who he was then. 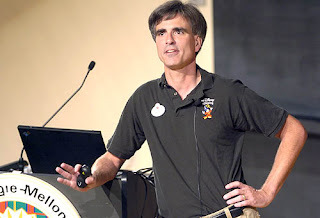 To keep a big story short, Randy Pausch is a professor in Carnegie Mellon and he has been afflicted with pancreatic cancer and he has only 3 more months to live. He shares his experiences, his insights and his thoughts in a talk called the "The Last Lecture", which has been downloaded by countless people all around the world and he still continues to encourage people to pursue their dreams. hey.. that was a great lecture.. if u have time.. listen to this harsha bhogles talk at IIMA also.. this is also very very nice talk..
Good one... Really motivating ! !